The deep and woodsy aroma of the grill permeates your senses the moment you step inside this sibling-run restaurant which has humble beginnings in Marikina. The smell is enough to whet your appetite for some good ol’ American-style barbecue. Somewhere in the kitchen are huge chunks of meat slow-cooked in a smoker with mesquite and hickory wood, fat rendered to keep it moist though charred, creating a crusty bark of blackened goodness, yet maintaining succulence. The menu boasts of a whole slew of starters, burgers and tacos, sides, smoked meats (in case you were wondering), and desserts, all of which we just wanted to have a bite of. Kudos to the food photography on the menu too, that we almost ordered everything but the kitchen sink. Listed here are some of our favorites. Chicken liver is love! With the little hearts attached, it’s beyond adoration. But that may be an unpopular opinion. 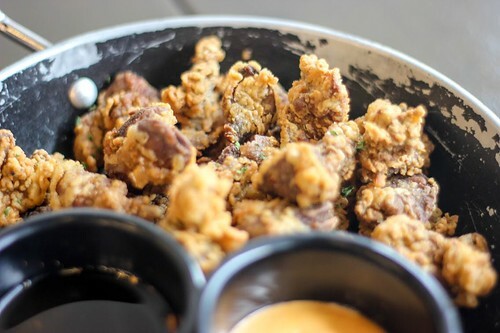 The Buttermilk Fried Livers (PHP 210) that just screams southern comfort might just change that. The livers are creamy which is the perfect counterpoint to the crispy buttermilk breading. The piedmont sauce accentuates the velvety texture and the kick of the BBQ rub. Also not a bad idea to mix it with the BBQ sauce at your disposal on every table. 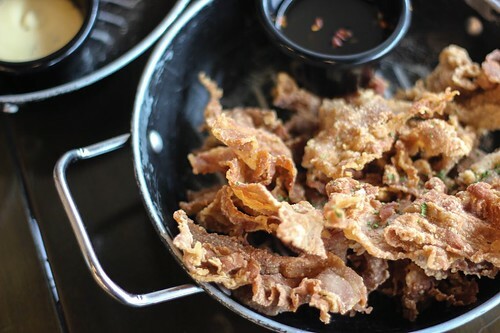 Hot Pork Poppers (PHP 175) are crispy breaded pork belly strips sprinkled with their BBQ rub. It’s crispy BBQ bacon! On another day I may just order this and rice and a fried egg if they will. Pro-tip, ask for some spiced vinegar for some bacon-as-chicharon action. Cheese don’t maketh the nachos. Pork does! 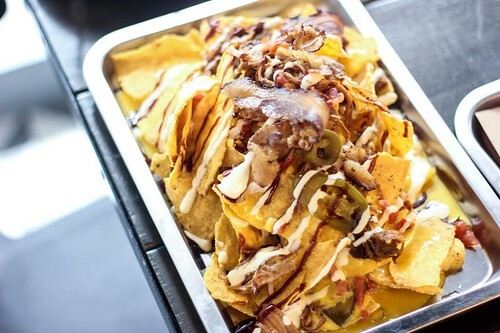 Jera’s Ultimate Nachos (PHP 330 half/PHP 600 full) piles on tender pulled pork and crispy bacon on top of nachos, jalapeños, and salsa, laced with homemade cheese and Alabama BBQ sauces. This is the plate that you come and go to in between appetizer, main, and dessert just because it brightens your palate with its freshness and richness all at the same time. 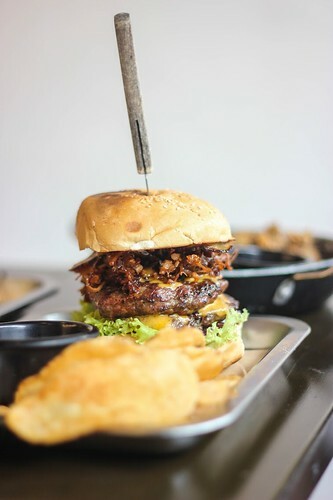 If you are looking for their top shelf burger, then look no further as they offer the Triple Death Burger (PHP 440). It’s beyond delicious! And as dying, going to heaven and living to tell the tale does not capture how superb this was, imagine doing that three-fold. Two quarter pound all-beef patties (cooked to medium, please), slathered with chipotle mayo and BBQ sauce, topped with crispy bacon strips and pulled pork, and dressed with the works (lettuce, tomato, onion, cheddar cheese) is what separates you and this burger monster from reincarnation. By the way, it also comes with a side of freshly fried potato chips! The showstopper of the day is the Smoked Meat Platter (PHP 2400). This is the embodiment of what a good smokehouse is: hot links, pulled pork shoulder, beef brisket. Chicken BBQ, and pork ribs all smoked to perfection! The deep amber color is just so tantalizing and the signature smoke ring around the meat cross-sections is truly the mark of a craftsman. Everything is fall-of-the-bone tender while maintaining its bounce and juiciness. 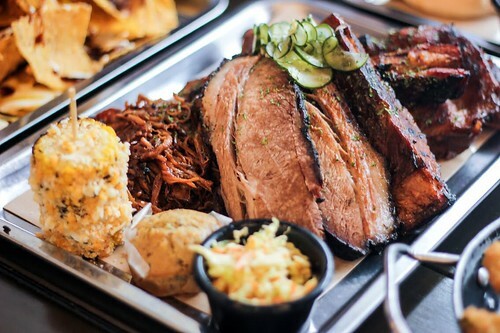 The brisket hits the home run with the intense meatiness that just melds well with the pungent rub and the smoky flavors that give your taste buds some zing. This cornucopia is served with a bacon and chive muffin, sesame coleslaw, rice, and Chiquitos grilled corn that tastes like Mexican elote covered in mayonnaise and cheese. That’s well over 3 pounds of food that should feed 4 hungry tummies. Don’t forget to find the right match with the sauces served table side. Meats on dessert was unthinkable 5 or 8 years back but God bless the soul of that one person who thought of putting bacon on a meal-ender. With its honey and caramel-like qualities and a salty dimension that heightens sweetness, bacon is the most obvious choice to fuse with desserts. 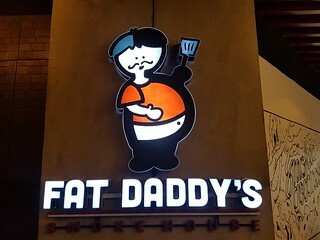 Fat Daddy’s definitely knows how to solve the meat and dessert equation in their Bacon and S’mores Dip (PHP 250). 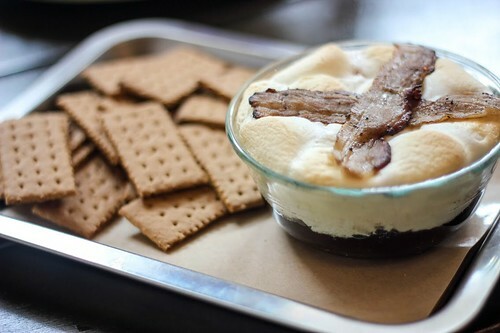 The chocolate ganache is mixed with crispy bacon bits and layered with torched mallows, served with graham crackers. And because they are extra, they crisscross 2 more bacon slices just before it lands on your table. Make a sandwich, dip the bacon, slurp the chocolate; do it your own way as this is such a fun saccharine experience that will bring out the kid in you. Imagine creamy cold pork passing through a straw. And that’s a good thing! 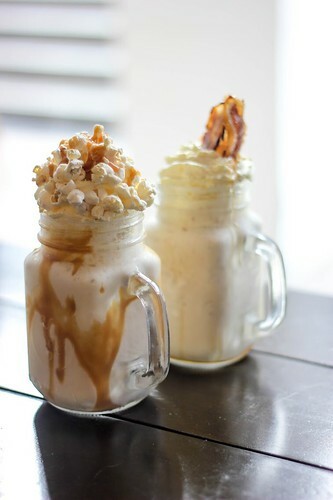 And while on the meat-meets-sugar narrative, gulping a Smokey Maple Bacon Milkshake (PHP 195) might not be a bad idea. Surprisingly, it’s not cloyingly sweet but coats your palate with the smooth yet deep creaminess that mellows out the strong flavors of the BBQ. Just in case you fall into meat-overload, the Caramel Popcorn Milkshake (PHP 195) is a good alternative to that sweet-salty extravaganza. 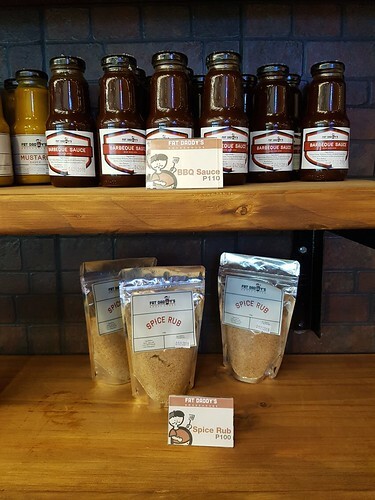 If you have withdrawals at the end of your meal and want to be reminded of how good Fat Daddy’s Smokehouse is, you can try preparing some barbecue at home with their pre-packed spice rub, and bottled sauces which comes in BBQ, Spicy Smokey, and Mustard. Just get that grill, oven, or broiler hot enough and it should work well enough even without a smoker. Also have that plateful of steaming white rice ready. 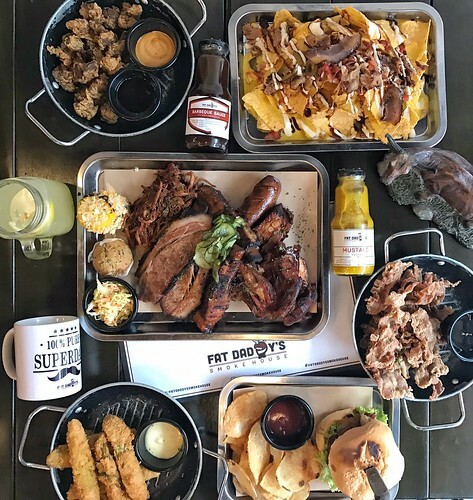 Every ounce of smoked meat at Fat Daddy’s Smokehouse is well-worth its weight in gold. 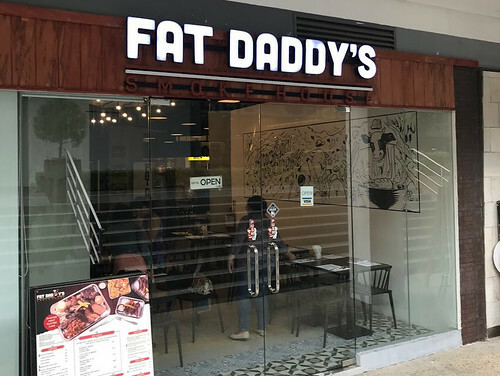 For the superb quality of their food, this joint won’t need you to break the bank to fill your guts.